The sound of chestnuts (castanhas) crashing down through branches is one that I always associate with autumn in Minho. Throughout the baking summer, we watched the thick green prickly clusters growing on large majestic trees scattered about the surrounding hill slopes wondering if they would ever ripen. By the middle of October, the clusters turned brown, some splitting open and ejecting their chestnuts, while others fell whole creating a spiny carpet on the ground below. A change in the weather in late October found us bent double against the wind and rain, baskets in hand as we set about gathering chestnuts. Rubbing the soles of our boots over the surface of the shell to split them open we reveled at the mahogany shine of a cluster of fat chestnuts inside. Prying them open, we scooped out the nuts and threw them into the basket to watch with satisfaction as the basket filled to overflowing. Then it was time to heave the loot over to the flat threshing floor (eira) found in many Minho yards and spread the chestnuts out for cleaning and sorting. If the chestnuts are too small or split open, or with tiny holes formed by burrowing worms, they were tossed aside for animal feed. Large piles of shiny brown chestnuts are then shoveled into orange woven sacks and weighed. Picking the chestnuts is one thing. It is quite another to sell them. In past few years, two guys have turned up looking for chestnuts for the annual Magusto or chestnut party held by the local junta. Normally this goes well, but there was one particular year they never showed. Eventually persuaded to come to our village, we proudly presented our mounds of chestnuts, but to our dismay, they shook their heads and condemned the whole crop as too dry. Last year the opposite happened. The same characters came by and told us that the chestnut harvest in Tras-os-montes was late and that the Minho chestnuts were at a premium at ?1.40 per kilogram. Uncertain whether to believe them, we held back on our collection. However we needn’t have worried, demand outstripped supply, and we quickly sold the lot. As for this year, word spread around our neighborhood that someone in the next village was buying in chestnuts to sell on to wholesalers. Delighted, we piled the sacks into our cars and set off to her quintal. In an old garage, we hauled our sacks onto her ancient scales, where the bags were lifted onto weights until lever was finely balanced; and after a quick calculation on a scrap of paper at ?1.50/kg, she brought out a shoebox full of cash and paid our fee. I had also heard about the buyers at the local feira or market held every fortnight in nearby Ponte de Lima. Curious to see for myself, I set off one Monday morning before dawn with my final pickings. It was one of those Minho mornings, torrential rain, and the wipers on the car were barely keeping up with the flow of water on the windscreen. I drove down the cobbled road towards the riverside where I could just make out a small crowd of people in my headlights and as I pulled up alongside a couple of trucks, a man with an umbrella pulled low over his face ran to the back of my car and attempted to open the boot. I leapt out and began the the ever expected haggle. ‘Um e cinquenta ?’ (?1.50) I asked, but with a sincere look of doubt, he countered ‘um e vinte’ (?1.20). Unwilling to budge, I sought out other interested candidates. Wet and frustrated, I held tight to the remaining chestnuts and took a wander through the market as daylight broke and watched as people struggled to erect their tarpaulins in the driving rain. Feeling quite damp and cold by this point I ducked into a nearby café and wrapped my fingers around a hot steaming cup of meia de leite (milky coffee) at the bar and listened to the banter of the market traders as they came in for their breakfast. The posters for Magusto celebrations were up in the shop windows. In this area of Minho it is usually held on Saint Martin’s day (11 November) when families and friends gather round a bonfire to roast chestnuts and sample their new wine for the first time. Legend has it that Saint Martin of Tours was riding home in a tempest when he came across a bedraggled beggar. He took off his thick heavy cloak and with his sword cut it in two giving one half to the beggar. Miraculously the storm cleared and the sun shone for the remainder of his journey. Ever since this act of kindness (according to legend) there has been sunny dry weather around this time in November known as the summer of São Martinho (Verão de São Martinho). This year true to the legend Minho was bathed in brilliant sunshine. We gathered in the grounds of the local junta headquarters on a clear crisp moon-lit November night. The women and children played games such as blind man’s bluff while the men built up the huge bonfire. Once this had collapsed and died down sack-fuls of dried pine needles on poured on top filling the air with a lovely fragrant pine-scented smoke. The cut chestnuts were scattered on top along with a sprinkling of salt. After a short while the embers were raked over and people scrambled down and, with their bare hands, searched the embers for the scorched chestnuts and threw them into large dishes. Eagerly we peeled the black charred skins off to reveal the soft ridged surface of the fruit inside, and bit into them savouring the hot creamy sweetness washed down with this year’s vinho verde tinto sloshed into white ceramic bowls; much in the same way that Beaujolais nouveau is enjoyed. In centuries gone by, chestnuts were a food staple in many parts of Europe, specifically in the mountainous areas around the Mediterranean where cereals couldn’t grow. Chestnut trees were known in as the ‘árvore do pão’ (bread tree), as they were collected and ground into flour to make bread and a variety of cakes and confectionary. In the late Middle Ages, there were three established trade routes taking premium chestnuts from southern Europe to Northern Europe. Two of these routes went from Italy via Lyon to Paris, while the other went from Milan up to Germany. The third brought chestnuts from Tras-os-montes and the Minho through ports in north Portugal and Galicia bound for Bordeaux before being sent on to UK and Netherlands. Because of the relatively short shelf life, only a small selection of the best chestnuts were selected for exports to northern Europe where they would be enjoyed by rich merchants and nobility. The remainder went into the local market or sustained peasant families (and their hogs !) through the long winter months. The 19th century saw a decline in chestnut production as other forms of starch such as wheat, corn and potatoes were introduced into the European diet. The major decline was also attributed to a series of harsh winters, in conjunction to ink disease, which wiped out large swaths of chestnut plantations (soutos). On the global scale China produces about 70% of the world’s chestnuts and Europe around 10%. Despite its small size, Portugal produces a similar tonnage of chestnuts as France and Spain while Italy produces significantly more. Today, chestnuts are grown in central and northern Portugal with the majority coming from the Tras-os-montes region in the north east of the country. In Tras-os-montes, chestnuts are so important to the local economy that in some parts chestnut producers are the main employers and some families rely entirely on this for income. A bad harvest can mean deep hardship for these families. There are four DOPs (Denomina?ões de Origem Protegida) for chestnuts; Castanha da Terra Fria, Castanha dos Soutos da Lapa, Castanha da Padrela and Castanha da Marvão. Tourists can visit the ‘soutos’ via the so-called ‘Rotas de Castanhas’ or chestnut routes staying in guesthouses along the way. In recent years, the high quality of Portuguese chestnuts, and international demand from European neighbours and the Americas, has led to a call for more chestnut production. Rich in vitamins and minerals, particularly vitamin C, folates and potassium, a carbohydrate content similar to potatoes and plantain, a high fibre content and absence of gluten all make the chestnut a healthy food choice and the restaurants and food industry are starting to take notice. There is nothing better on a cold winter’s day than enjoying delicious chestnuts cooked on a brazier in the street and served in a newspaper cone. 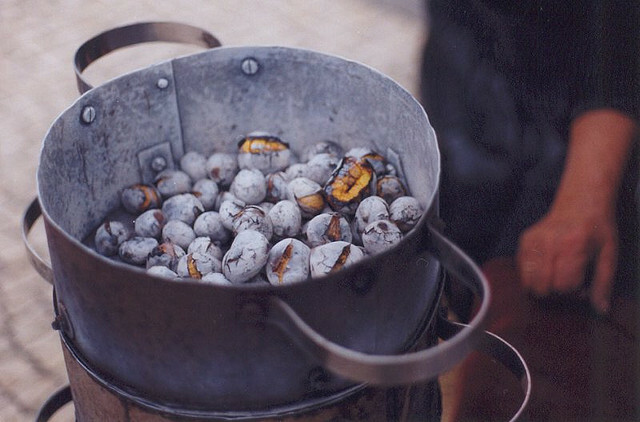 In this corner of Portugal another way of enjoying chestnuts is to add them to a stew commonly found in Minho region. When buying the chestnuts in the markets the key thing to look out for is that the shells or cascas are shiny and intact and once home they must to be stored in a cool dry place, spread out and apart from each other if possible. They can be kept for three months or their life extended to six months by freezing. Season the pork with thinly sliced ? ?onions, crushed garlic cloves, lard, parsley, bay leaf, salt, pepper, paprika and wine and marinade for 24 hours, stirring occasionally. Place the lard in a pan and when hot add the pork and brown and then add a little of the marinade. Cover and leave to cook on medium heat, stirring occasionally. Separately boil the chestnuts in salted water, peel and then add to the pork just before serving.